X Rebirth breaks the veil of silence and brings not only confirmation of its promised release date but also some answers to fans' questions and a new series of in-game videos. The action-loaded space simulation from Egosoft and Deep Silver will be released in Europe on the 15th of November 2013. "After seven years in development, people are naturally wondering why X Rebirth took so much time," says Egosoft's Studio Head Bernd Lehahn. "The reason for this is the sheer scope of our project. We not only want our universe to be huge, we want it to be huge and teeming with life. To me, the success of the Star Citizen funding shows that many people are waiting for our kind of game. 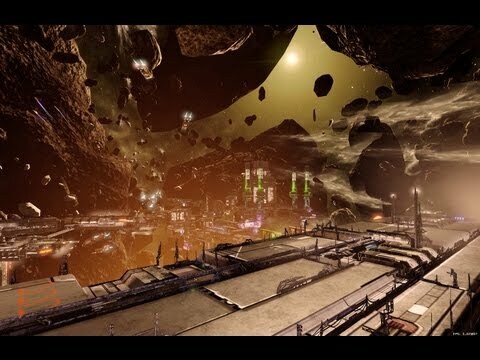 A single factory compound in X Rebirth may consist of hundreds of buildings, some of which are so large that ships measuring kilometers in length can dock inside them. The player can even disembark in order to explore the station and meet its inhabitants." There's also some good news for our fans in North America: Egosoft and Tri Synergy will be releasing X Rebirth on the 15th of November 2013 for the US market. We'd like to invite all our fans to visit the gamescom during the 22nd to 25th of August in Cologne. You will have the chance to play the new Egosoft title for the first time in public at the Deep Silver booth in hall 9.1 B11/C10. Be among the very first to set foot in the new universe of X Rebirth and gain a quick impression of its looks and gameplay. Today we begin a new series of developer diaries featuring some previously-unseen in-game material. In "What took us so long?" Bernd answers the frequently-asked question regarding the lengthy development time and then demonstrates the breathtaking beauty and scale of the new X-Universe. 'Complex, but not complicated' describes one of the principal features of X Rebirth as demonstrated by the much-simplified game controls. The video "In Control" is the first of a pair of linked-videos demonstrating the much-simplified in-game control and interface methods. This first one covers the use of a gamepad controller. We will show further videos such as this on a more regular basis up until release date. Our new Steam website will also cover helpful information and breaking information about the game. Visit it now for system requirements, additional screenshots and video coverage. X Rebirth will be released for PC in Europe on the 15th of November 2013 and in North America on the 15th of November 2013. All editions will require online activation through Steam. No persistant online connection is required to play. As a special treat, both, Steam and Egosoft are offering a 10% pre-purchase discount for the digital version. An additional bonus for all those ordering the digital version (Steam Key) directly from Egosoft: you will be able to download the X Rebirth Soundtrack immediately after purchase! The X Rebirth Collector's Edition (German box and manual) will come with the game on DVD, the soundtrack on Audio CD, a Video DVD with developer videos and trailers, trump card game, Encyclopedia extension, Artworks and more which will be revealed soon. Details regarding an English (UK) Collector's Edition will be announced soon. This edition is only available in German (box and manual) and will contain the game and the soundtrack on Audio CD. You will receive a STEAM activation key and instructions and can enter the key now to preload the game in November prior to activation on November 15th. If you buy directly from Egosoft you will additionally get information on how to download the X Rebirth soundtrack right NOW. The Egosoft Shop offers two versions of this edition due to tax reasons. A worldwide edition which can be activated anywhere and an "outside Europe only" edition that, as the name suggests, can only be activated outside of Europe. Last edited by BurnIt! on Sat, 24. Aug 13, 17:24, edited 1 time in total. Game looks breath-taking .. job well done. Looking amazing. Love you long long time Ego! Woohoo! But how about abit more hype! This game is virtually hiding away from the public! Last edited by muppetts on Thu, 8. Aug 13, 17:27, edited 1 time in total. X-Rebirth looks to be more than i ever hoped for. Big congrats to Egosoft for your hard work. This is awesome! Thanks ego for such a great game! Looking forward to it! looks awesome! good job guys! Holy hell. That's going to keep me occupied for a long time. Very exciting news. And it looks so good watching the trailer. Can't wait to check out your universe. Holy badass batman, I'm stunned. I'd almost forgot about Rebirth with all the Star Citizen hoopla, can you ever forgive me egosoft? Beautiful. I can sense that I am witnessing something epic about to happen. I am totally ready for something new. Graphics look amazing, looks like you really can get off the Skunk for awhile for station/person interaction. It's the "let your crew pilot large ships" part that I can't get excited about. Why would an admiral stay aboard a patrol boat instead of his carrier/battleship? Everything else about this game looks awesome. YESSS I will see you at Gamescom and will probably spend the entire time waiting in line for the X-R demo again and again. Samuel Creshal wrote: Keyboards: What separates the men from the boys. wicked videos! dead exited but I still didn't see a cross dressing paranid! I used to list PC parts here, but "the best" will suffice!